Capital One offers some of the highest interest rates of any savings products we review. Plus, you can count on keeping those returns since the bank doesn’t charge account maintenance fees. With full-service branches in eight states plus Washington, D.C., Capital One offers a physical presence, as well as strong online tools and an app experience. The company has recently introduced Capital One Cafes in big cities in eight states across the country, adding another opportunity for face-to-face interactions. In addition to its Capital One 360 Savings® Account, Capital One offers nine certificate of deposit (CD) accounts and a money market account (MMA), among other offerings. If you’re looking for a place to park your money that earns decent interest but also makes it fairly accessible in case you need cash for an emergency or a down payment, it’s worth considering the many savings options Capital One provides. We’ve got details on those products below. Capital One is one of the most recognizable banking brands not only in the U.S., but in Canada and the U.K., as well. Starting as a small business founded in 1988, the company has grown to a Fortune 500 company offering a range of banking, investing and credit options and more. It also offers a number of personal finance education services and materials. The company promises a convenient and valuable experience for the customer it serves. With its wide variety of financial offerings, it can certainly be convenient for you if you’re looking to keep all your accounts in one place. For example, you can open a Capital One credit card and a Capital One IRA, gaining the ease of working with only one institution. Plus, you can easily manage any and all accounts by going online, calling or visiting one of their many physical branches. In addition to its other financial offerings, Capital One offers a few different kinds of savings accounts. These include a traditional savings account, a money market account and various CD accounts. The company offers some of the best APYs connected to each savings account. Plus, you can avoid account maintenance fees when you open one of these savings accounts. Capital One provides FDIC (Federal Deposit Insurance Corporation) protection on your deposits up to the legal amount. Most savings account types do offer a few options in terms of what kind of account you want to open. This means you can open an account either as an individual account, a joint account, a joint account with a minor or a living trust account. Access to Your Savings Account Online or mobile, you can also call Capital One customer service any day of the week between the hours of 8 a.m. and 8 p.m.
Security FDIC insurance up to the maximum amount allowed by law, secured website and files. Fees Fees may be charged for an outgoing domestic wire and a copy of a statement within the last two years. Current Terms and Rates 1.00% APY for both 360 Savings® and Kids Savings Account. When it comes to your basic savings accounts, Capital One offers the 360 Savings® Account and the Kids Savings Account. The 360 Savings® Account offers a 1.00% APY with interest compounded monthly. There is no minimum amount that you have to deposit initially, nor is there a minimum amount you have to maintain within the account. Your money will earn interest regardless of how much money is inside. There are a couple of fees that you could see with a 360 Savings® Account. Completing an outgoing domestic wire transfer will cost you, as will a copy of a statement generated within the last two years. You may also see a penalty for exceeding the maximum amount of outgoing transactions. You are limited to six outgoing transactions by federal law. To make a deposit into your 360 Savings® Account, you have a few options. You may deposit funds over the phone, online, mailing a check, an electronic funds transfer or a domestic wire transfer. You can also deposit cash. The length of time between your deposit and its availability will vary depending on the type of deposit, but you can usually expect the funds after four days. Withdrawing money from your 360 Savings® Account is as simple as calling customer service or going online. You cannot withdraw more than what’s in your account at the time. You will also have to keep track of your withdrawals as you are limited to six outgoing transactions per statement cycle. Going over that limit will end up in a penalty fee. If you're ever unsure how many transactions you've made, you can easily head to your online account and manage your account(s) on its account page (like shown above). The Capital One Kids Savings Account allows you to deposit money into an account for your child to teach them about saving and investing. This account also comes with no maintenance fees or balance/deposit minimums, which can help show your child that savings doesn’t have to be costly. The only fee listed in the account disclosure is for a copy of your statement. Plus, the Kids Savings Account has the same APY as the regular savings account, so your child’s savings can be nicely padded, like yours. The processes of depositing and withdrawing money is the same as the 360 Savings® Account. Both accounts also offer access to Capital One’s Automatic Savings Plan. This program allows you to set your savings accounts settings and then revert to autopilot. Your accounts will do all the growing and all the work. This is an ideal program especially for the Kids Savings Account, so you and your child can watch the funds grow without much stress. With the ease of a website and a mobile app, you can change your settings at any time. In terms of security, both accounts are also FDIC-insured up to the legal amount. You have a few different options when it comes to savings account ownership. With either account, you can open it as an individual account, a joint account or as a living trust account. There are further rules and regulations surrounding opening a joint account and a living trust account. You should make sure you read your agreement papers to know exactly what’s entailed. In the case of the Kids Savings Account, you may open it as a joint account with a minor. This means one minor and one adult both own the savings account. Access to Your CD Online, mobile and via phone. You may also send checks in the mail. Plus, renewal is automatic at maturity date. Fees A fee of $5 will be charged for a copy of a statement generated within the last two years. Penalties will apply should you withdraw from your CD before its maturity date. A certificate of deposit (CD) is another kind of savings account, but a less flexible one. Once you make your initial deposit into the account, you cannot touch it without penalty until its maturity date. There are usually a number of varying term lengths, though, from a couple months to a few years. That way you can find a CD depending on whether you need a more immediate return or a more long-term return. As an extra perk, Capital One allows you to add beneficiaries to your CDs, which you can easily do through your online account. Capital One 360 CDs come in varying term lengths between six months and five years. The exact APY will depend on the term length, but generally the longer the term, the higher the APY. Regardless of your starting APY, Capital One guarantees that rate for the length of your CD term. You also get to choose whether you want your interest to be paid out at the end of the full term, monthly or annually. To make your CD deposit, you have a few options. You can transfer money from another bank account, use Capital One’s automated phone system, call a customer service representative or go online. Again, your deposit is FDIC-insured up to the legal limits. You will also have the option of opening a CD as either an individual, joint, joint with minor or living trust account. When it is time to withdraw funds from your CD, you usually will get a grace period of about 10 days to do so. If you don’t take any action, Capital One will automatically renew your CD for the same length of time. Should you withdraw before your CD’s maturity date, you will face penalties. For CDs with a term of 12 months or shorter, the penalty is three months’ interest. For CDs with a term longer than 12 months, the penalty is six months’ interest. CDs can be a valuable part of any investment portfolio. If you have questions about how to build a robust savings profile that includes accounts like the ones at Capital One, SmartAsset’s free tool can match you with top financial advisors in your area. All you need to do is answer a short questionnaire that gives some insight into your financial needs. If you’re ready to be matched with local advisors that will help you achieve your financial goals, get started now. 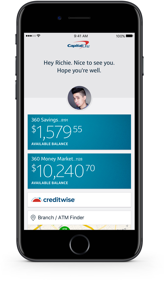 Access to Your Money Market Account 24/7 access to your accounts online and on the Capital One mobile app. You may also call customer service any day of the week between with the hours of 8am-8pm. Fees You may be charged a $30 fee for an outgoing wire transfer and a $5 fee for a copy of a statement generated within the last two years. 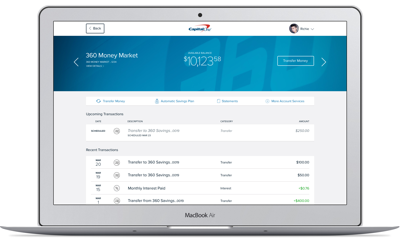 Capital One also offers the option of a 360 Money Market® account (accompanying example of account page). A money market account is another type of savings vehicle that usually has higher interest rates than a traditional savings account. Money market accounts can even come with checks and debit cards, although the 360 Money Market® account does not. You can get a money market account from most banks, credit unions and other financial institutions. The Capital One 360 Money Market® account offers a decent APY that is still much higher than many other banks’ offerings. You technically don’t have to have a minimum balance, but a higher one will get you a better rate. Luckily, your money will be allowed to grow without any fees. The only fees that may apply are for outgoing domestic wires and a statement copy for statements within the last two years. To make a deposit, you have a number of different options. You can call, go online to make transfers, go on your mobile app, mail a check or initiate an electronic funds transfer. You may also try to initiate an incoming domestic wire, but the company won’t always allow those. Generally, your deposits will be available for use after at most four business days. Again, deposits of up to $250,000 (the legal amount) are protected by the FDIC. Access to Your 360 Checking Account Easy access online and with your Capital One mobile app. Security Passwords, PIN and mobile and online security. Fees There are no fees for account maintenance. Both the 360 Checking® account and the MONEY account have a number of fees that may be charged for certain transactions. Not only do Capital One’s savings accounts earn interest, but so do the checking accounts. The company offers two types of checking accounts, the 360 Checking® and the MONEY account, specifically for teenagers. The 360 Checking® account earns at a 0.20% APY on balances from $0 - $49,999.999, a 0.75% for balances from $50,000 to $99,999.99 and 1.00% on balances of $100,000 or more. Interest is compounded and credited monthly. You will receive a free MasterCard® debit card to make your purchases and ATM withdrawals. You will face some limitations when it comes to spending and withdrawals, like most other debit cards. Total card purchases and withdrawals are limited to $5,000 per day. This limit includes ATM withdrawals, cash advances and signature and PIN purchases. Withdrawals made from an ATM using your 360 Checking Card are limited to $1,000 per day. To decrease your ATM withdrawal limit, you may call Capital One's customer customer service. Other limitations include that of $100,000 maximum for “bill pay,” “mail a check” or cashier’s check. While there are no fees for the maintenance of the 360 Checking® account, there are fees for other transactions. There fees can be charged for cashier’s checks, a stop payment, physical checks sent through a courier, expedited debit card shipping, outgoing domestic wires, returned checks, overdraft, statement copies and subsequent checkbook orders. You can open a 360 Checking® account as an individual account, joint account or as a living trust account. The MONEY account is a checking account designed for teenagers to manage together with a parent or guardian. By sharing the account, teens are able to learn about being responsible with a checking account and debit card while you, as a parent, can keep an eye on the account. There is no minimum deposit or balance requirement. The Capital One MONEY account carries an APY of 0.25%, no matter what your balance is. Interest is compounded and credited on a monthly basis. Plus, unlike the 360 Checking® account, there are only three fees that may be charged. These include an expedited debit card, a physical check sent through a courier and a statement copy. However, if you avoid these transactions, you can avoid the fees. You will also run into purchase and withdrawal limitations. It’s important to check your account agreements, since account owners under the age of 18 will have lower limits. To increase or decrease these limits, or manage your account, you can always call Capital One customer service. It’s important to know that with a MONEY checking account, you will also get a MONEY debit card. This card will be issued to the teen of the account. The adult connected to the account will not get another card. You should also know that this account will be opened as a joint account, rather than an individual account. Access to Your Account Online or through the Capital One mobile app. If you really want to keep all your financial accounts in one place, including your retirement savings, you’re in luck with Capital One. You can open an IRA through Capital One Investing or Capital One 360. In order to open a 360 IRA, though, you will already need to be a Capital One 360 customer. This means you already have a 360 savings, CD or checking account. Whether you open an IRA through Capital One Investing or Capital One 360, you will have much of the same opportunities. Both offer the option of opening a Roth or a traditional IRA. You can also roll over or transfer funds from other institutions into your Capital One IRA. Plus, neither will charge account fees or require minimum balances or deposits from you. Both routes offer FDIC-insured savings with interest. With a Capital One Investing IRA, it is an FDIC-insured cash balance of up to $250,000. With a Capital One 360 IRA, your savings are FDIC-insured in CDs and cash savings. Another difference is that you can invest in various assets like mutual funds, ETFs, stocks, bond funds and more with a Capital One Investing IRA but not a Capital One 360 IRA. Where Can I Find Capital One? You can find Capital One online at capitalone.com. There is also an app for easy access to your accounts. If you need to speak to someone on the phone, you can easily find the phone number for the corresponding department on the website. The hours you can call will depend on the department and the services you need, but generally employees will answer from 8 a.m. – 8 p.m. There are also physical branches that you can visit in New York, New Jersey, Texas, Louisiana, Maryland, Virginia, Delaware, Connecticut and the District of Columbia. To see if there is a branch near you, you can visit the website and find a location using your address or zip code. The company has recently introduced a unique feature. They have begun rolling out Capital One Cafes, a hybrid location of a Peet’s® cafe and a Capital One bank branch. These cafes offer a more comfortable environment to do your banking. Instead of a cup of office coffee, you can order a Peet’s® beverage made by a barista along with your choice of baked goods at a Capital One Cafe. Once you’ve got your treats, you can hang out like you would at any other cafe. Then you can easily finish up your Capital One banking needs at the cafe. You can open a new account, pay your bills, apply for a credit card, make deposits and withdrawals or learn more with the company's tools and materials. Plus, the Cafe provides a more relaxed banking experience. We bet you never thought you would hang out with friends at your bank! You can find Capital One Cafes in California, Colorado, Florida, Illinois, Massachusetts, Minnesota, Pennsylvania and Texas. What Can You Do Online With Capital One? You can virtually do everything you need to do with your Capital One accounts online. You can explore the many financial offerings, from auto loans to home loans to IRAs. You can just as easily apply for those accounts and loans online. Once you have an account, or more than one account, you can sign in to your online accounts to manage them all. Capital One also provides a ton of educational materials on personal finance. There are blog posts, communities, financial literacy programs and more to help you get more acquainted with financial terms and opportunities. Plus, you can interact with the company through multiple social media platforms like Twitter and YouTube. 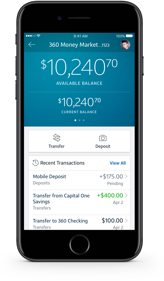 You can even access your accounts and help on the go with the Capital One mobile app. The accompanying image provides an example of what your mobile experience might look like once you log in. From there, you can click on the accounts you want to manage, find the nearest branch or ATM to you and more. Like most things nowadays, you can most easily access your Capital One accounts online or on your smartphone mobile app. Once you have an account, you can log in through the website or on the app. For example, this image is what it might look like on your mobile app if you chose to manage your 360 Money Market account. Whether on mobile or online, you can check on your account balances and transactions and transfer money. Plus, you can deposit checks easily on your mobile app. Luckily, all your accounts will be in one place for your convenience. You won’t have to have different usernames or accounts to view your IRA and your checking account, for example. You may also call the appropriate customer service number for your account to manage your accounts. Or, if you live close to a physical location that offers the services you need, you can head there. How Can I Save More Money With a Capital One Account? Capital One offers interest on both its savings accounts and its checking accounts. This means that not only can you put away some of your money for safekeeping, but you can be assured that it will grow (at least a little) while it sits there. Many banks and other financial institutions don’t offer that earn interest. You also get to save money on fees when you bank with Capital One. There are no fees to open or maintain an account, which allows your money to grow largely unharmed. Of course there will be fees for certain transactions, but if you’re able to avoid those, you can also avoid the fees. What’s the Process for Opening an Account With Capital One? 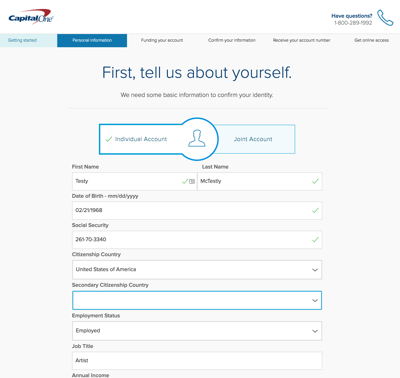 Often, opening an account with Capital One is as simple as going online to its website, finding the account you want to open and clicking “Apply” or “Open Account.” You will need to provide personal information like your address, email address and Social Security number on a page like this example image. Online applications are secure, but you can also visit a physical branch if you want. The exception is a MONEY account which you can only open through the website. Once you’ve opened an account, you will need to make your initial deposit. Capital One accounts don’t require a minimum amount to deposit, so you won’t have to worry about that. You will have to make a deposit within a set time period, however, or else Capital One will close the account. Some accounts might require more from you to qualify before you can open an account. For example, you cannot open a 360 IRA unless you already have another 360 account like a 360 checking account. If you’re looking for a financial institution that has branches throughout the country, or even the world, you might want to look elsewhere. Capital One does have 755 physical branches and 30 cafes, but they’re pretty much limited to New York, New Jersey, Texas, Louisiana, Maryland, Virginia and the District of Columbia. Capital One offers a good rate of return on its savings accounts, plus the checking accounts earn interest, which is relatively rare. However, some people might want higher rates. Some accounts do require quite high balances to achieve a higher APY. Even so, Capital One outperforms other big institutions like Wells Fargo and Chase, who offer a mere 0.01% APY on their savings accounts. Plus, with so many different financial offerings, you would be more able to keep all your accounts in one place with Capital One. All in all, Capital One is a huge player in the financial game for good reason. Not only does it offer credit cards, but it also offers various savings accounts, checking accounts, auto loans, investing opportunities and more. This makes it an ideal choice for anyone who wants to avoid the hassle of banking or borrowing from too many institutions. Plus, Capital One offers some of the best rates when compared to other huge companies. Even the checking accounts earn interest. If you’re looking for a reputable company with millions of customers, Capital One could be a good choice.